A Companion to the Gilded Age and Progressive Era presents a collection of new historiographic essays covering the years between 1877 and 1920, a period which saw the U.S. emerge from the ashes of Reconstruction to become a world power. Christopher McKnight Nichols is Associate Professor of History at Oregon State University. He is author of the award-winning book, Promise and Peril: America at the Dawn of a Global Age (2011), co-editor of Prophesies of Godlessness: Predictions of America’s Imminent Secularization from the Puritans to the Present Day (2008), and Senior Editor of the two volume Oxford Encyclopedia of American Military and Diplomatic History (2013). Nancy C. Unger is Professor of History at Santa Clara University. She is the author of Beyond Nature’s Housekeepers: American Women in Environmental History (2012) and the award-winning biographies Fighting Bob La Follette: The Righteous Reformer (2000), and Belle La Follette: Progressive Era Reformer (2016). 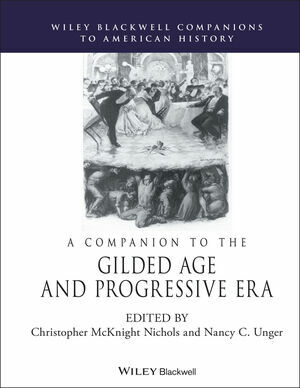 Scholars of the Gilded Age and Progressive Era, along with graduate and undergraduate students, will fine A Companion to the Golded Age and Progressive Era, edited by Christopher McKnight Nichols and Nancy C. Unger, an essential resource. The thirty-four essays contained within it, arranged in eight thematic sections are authored by a combination of the field's leading scholars and its rising stars. These pieces range from good to excellent. Overall, this volume combines a profound appreiation for the historians who have long defined this period...with a commitment to moving beyond the belief in American exceptionalism that, consciously or not, guided their writings. Specifically, key essays in this Companion contextualize the GAPE within a global framework.